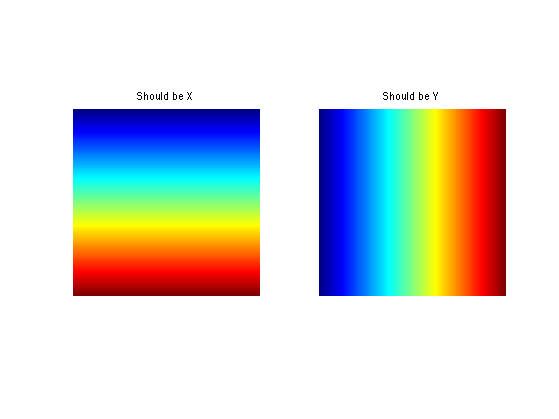 This tours tests several barycentric coordinates (mean value, harmonic and green) for non-convex polygons, and apply them to 2D warping of images. Create a cage that bound the domain to warp. 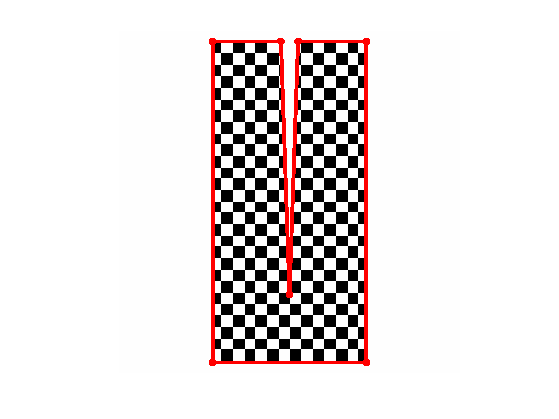 First we create a 2D closes polygon, which will be a cage used to perform 2D shape deformation. 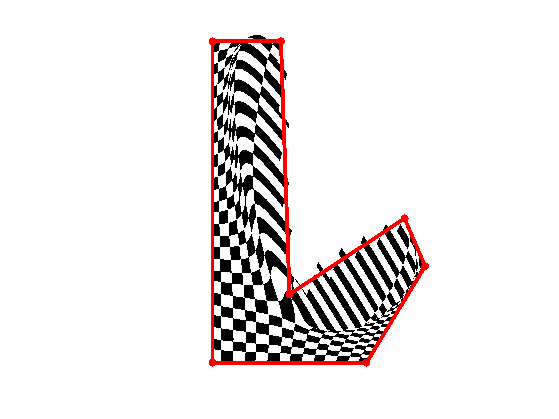 Compute a check-board texture inside the L shaped domain. 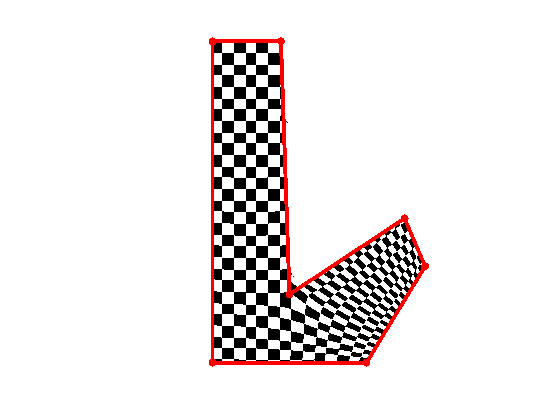 Mean valued coordinates are usually applied for 3D mesh parameterization, and are used to approximate the Lapalcian on a 1-ring of a triangulation. M. S. Floater, Mean value coordinates Comp. Aided Geom. Design 20, 19-27, 2003. K. Hormann and M.S. Floater, Mean value coordinates for arbitrary planar polygons ACM Transactions on Graphics, 25 p. 1424-1441, 2006. 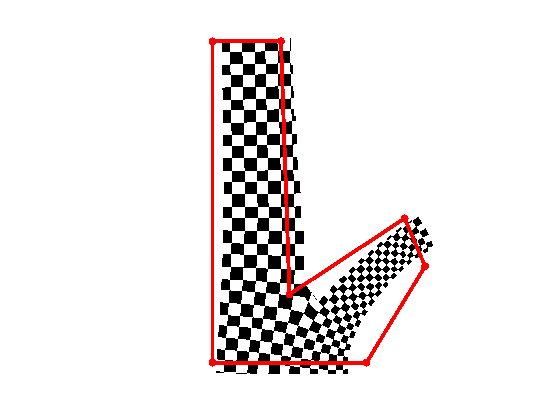 T. Ju, S. Schaefer and J. Warren, Mean Value Coordinates for Closed Triangular Meshes ACM SIGGRAPH 2005, pages 561-566, 2005. Each C(:,:,i) will be a barycentric coordinate weight. Select a point on the polygon. 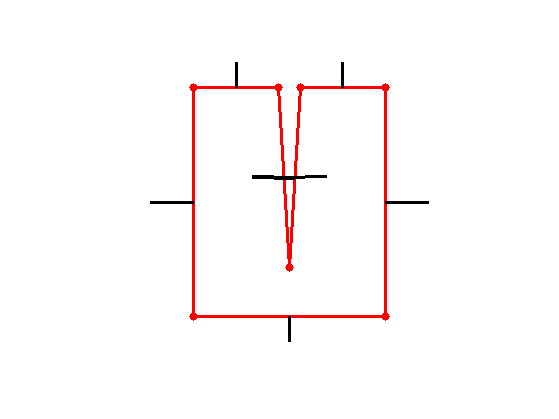 Compute the mean coordinate at each point location using the tangent of the two adjacent angles. Exercice 1: (check the solution) Compute the full set of mean coordinates. Extract one of the coordinates, set it to zero outside. 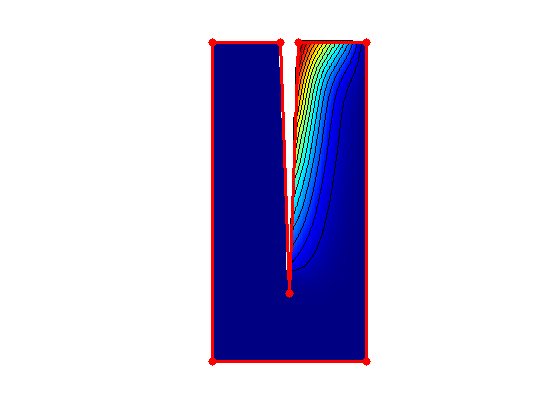 Apply the interpolation weight to the X/Y coordinate to test for the linear precision of the coordinates. Final position of the cage. Modify the position of the cage. Mean valued coordinates goes in some sense "through" the cage. 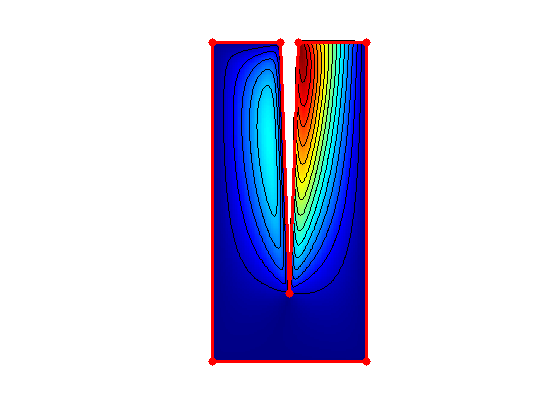 To prevent this, one can compute coordinates using a diffusion within the cage. 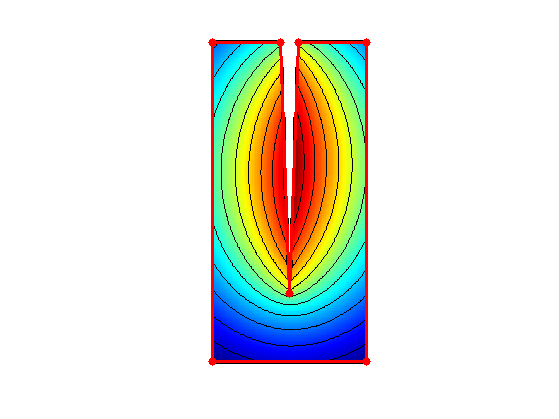 This leads to harmonic coordinates. Compute the points on the grid that are along the boundary, together with the curvilinear absice. 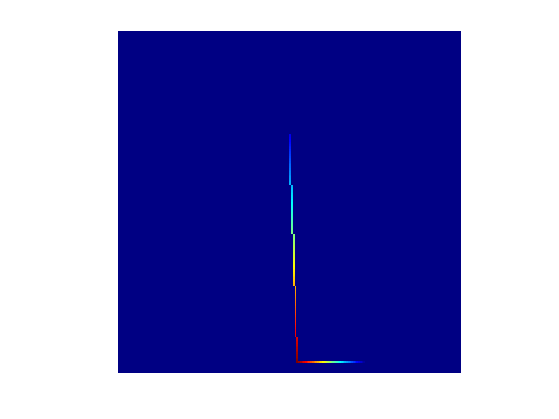 Compute the "hat" interpolation function at a given vertex location. 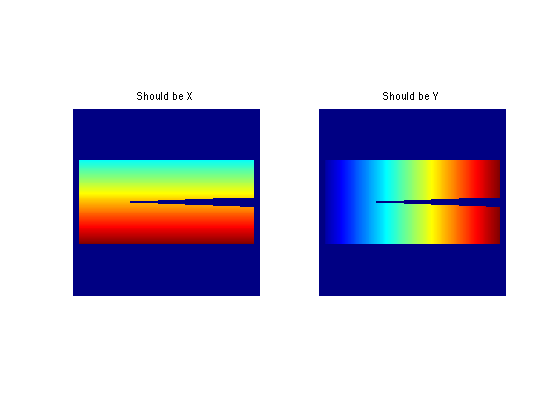 Exercice 2: (check the solution) Perform the full computation of the coordinate C(:,:,i) by iterating the diffusion and imposing the boundary value. Exercice 3: (check the solution) Compute the full set of coordinate functions C.
Apply the interpolation weight to the X/Y coordinate to test for the linear precision of the coordinates. Here it is only valid inside the shape. Y. Lipman, D. Levin and D. Cohen-Or, Green Coordinates ACM Trans. Graph., 27(3), pages 1-10, 2008}. Fist compute the oriented normal to the cage. Each C(:,:,i) is a barycentric coordinate weight for the vertices, i and D(:,:,i) is a barycentric weight for the edge (i,i+1). See the Green Coordinate paper, Appendix A, for these formula. Add the contribution of this edge to the weights. Exercice 4: (check the solution) Compute the full Green Coordinates. Warp the grid. Do not forget to multiply the normal weight by the amplification factor. 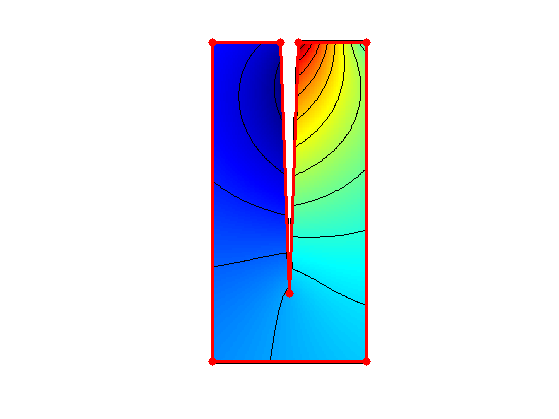 Exercice 5: (check the solution) Compare the Mean value, Harmonic, and Green coordinates on serveral cages, including a cage enclosing a caracter with two legs. Try to move the legs, and compare the results. The barycentric coordinates extends to 3D volumes. 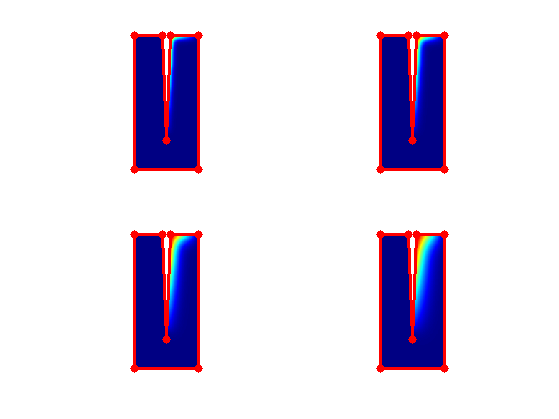 Exercice 6: (check the solution) Extend the Harmonic and Green coordinates methods to volumetric cages and volumetric data.